1. What financial incentives do you offer? Always ask whether a builder offers any type of incentive. Some builders may offer incentives if you are referred by an existing home owner or buy a certain amount of upgrades. Other builders may run special pre-construction or seasonal offers. It can’t hurt to ask! In addition, some builders may offer incentives to buyers who use the builder’s preferred lender and title company. 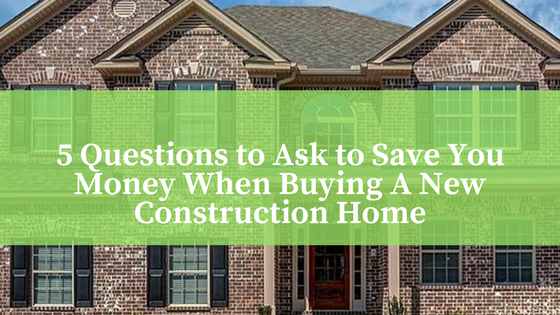 Such incentives may include the builder paying thousands of dollars in what would otherwise be the buyer’s closing costs, or special pricing on select upgrades such as hardwood floors or granite. You should still shop around and get quotes from other lenders before deciding to go with a builder’s preferred lender. Be sure to compare not only interest rates, but all of the terms of each loan to make sure you are getting an apples-to-apples comparison. 2. Which are the standard features and finishes? When you tour a development’s model home, keep in mind that you are often viewing a version of the builder’s standard home that is decked out with “all the bells and whistles”. Therefore, you need to find out which features and finishes are standard (therefore included in the base price of the home), which are upgrades, and what each upgrade costs. One way to cut costs is to make a list of “gotta haves” and nice to haves”. Be selective in your upgrades, include all of your “gotta haves”, and then some items from your “nice to have” list, budget allowing. One benefit of having the builder do the upgrades (as opposed to having it done oneself) is that home buyers can roll the cost of upgrades into their home loan. 3. What are the homeowners association rules and regulations? Each homeowners association (HOA) has its own Declaration of Covenants, Conditions, and Restrictions and Bylaws. Get a copy of these from the builder and review them carefully. Violations of the HOA rules and regulations can result in the imposition of penalties. You want to avoid that! Also, look into how much the HOA dues are and when you are required to start paying them. These items vary by builder and development. 4. What warranties do you provide? Most builders offer at least a 1-year workmanship warranty. Make sure the warranties you receive explicitly state what is and isn’t covered, and what the limitations are for damages. You should also receive manufacturer’s warranties on appliances such as washer and dryer, hot water heater, air conditioner, kitchen appliances, and roof, to the extent applicable. 5. Can I talk to some of your past customers? Caution: References provided by builders will likely be skewed in their favor. Try to seek out some past customers on your own. You can find these people by knocking on doors of homes that have already been built in the neighborhood. Checking a builder’s online reviews is also a good way to check references.